Francesca Bonesio (1976, Turin), Italian-born architect, researcher, teacher and visual artist. Nicolas Guiraud (1970, Bayonne), French photograph and visual artist. 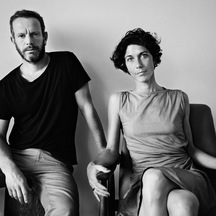 Together, they founded Atelier 37.2 in Paris in 2009 : they conceive and realise art installations in public spaces, inhabited sculptures and land-art, on the edge of art and architecture. Alone, or with a bigger team, for public or private orders, they have already built… ...a monumental 300 meters long land-art pièce on the top of an ancient volcan ("Arteology" for Horizons - Art Nature festival, Auvergne), a series of plug-in sculptures to be occupied by dansers ("Graft" for Centquatre, Theatre de la Ville, Temple galerie in Paris), an inhabited sculpture in Danemark, where the horizon line disappears when you sit down ("New horizon" for "Sculptures by the sea" festival in Aarhus, Danmark), a 10 tons coquillé-limestone art pièce, traversed by a Calanques blue glass slab, ("Bleu calcaire" Oceanology research center, Marseille), a group of 5 plane-tree’s skin concrete sculptures ("La troisième île", for the public Library Le Bouscat)... in addition to the first 200 White walkers... They are now ready to produce the White-walkers European Odyssey thanks to your help!